Grab bars, as pictured here, are the most common type of bar and what most people think of when they think of grab bars. They come various lengths, usually beginning at about 12 inches and ranging up to 36 inches, although some manufacturers do produce longer versions. 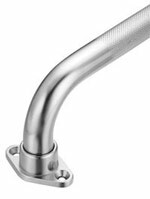 The pictured grab bars are chromed steel with a knurled section (area with ridges cut into the bar in a diamond pattern) to reduce the chance of the user's hand from slipping, but chrome bars are available without knurling. 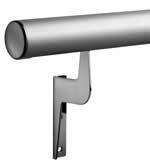 Grab bars that are painted steel or stainless steel can also be purchased. Whether chrome, painted or stainless steel, as long as the user can grip the bar safely, it's an aesthetic issue on which to choose. More important than the design of the bar is the installation of the bar. The bar must be securely fastened to the wall, preferably into a wood stud. If there isn't a wood stud placed appropriately for installation, the wall should be reinforced by some means. The bars can be mounted vertically, horizontally or angled. The PromenAid grab bar is a new innovation in grab bars that can be installed as a grab bar or installed as a handrail for walking and standing support anywhere. Conventional grab bars and handrails are sold in a variety of standard lengths and the user has to compromise between what will install properly in their situation and what will work best for them. This grab bar is available in a variety of standard lengths or can be cut to a custom length as needed on site. Regardless of the length of the bar, the installer can easily adjust the position of the mounting brackets to where the wall's studs are located and is not limited to the predetermined spacing on conventional grab bars. A variation of the grab bar is a bar known as a right angled or "L" shaped grab bar. The right angled grab bar can be of different constructions and designs as the bars described above but there is a 90 degree or "L" shape angle built into them. They are often available as right hand bars or left hand bars with difference being which way the bar is bent (left or right from the vertical section). These also can be mounted in whichever way works best for the user. 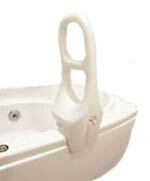 Designed only for bath tubs, the clamp-on grab bar clamps to the side of the bath tub to provide a secure handhold for people stepping into their bath tub. There are several designs, makes and models of clamp-on bath tub grab bars but they all have the fact that they clamp on. While they do aid in the entry to the tub, if not placed well, he can inhibit entry into the tub. These bars are not designed for use by someone who does a sliding transfer into the tub. They are designed for ambulatory people who can step into the tub. The only issue I have with these bars is they must be installed securely. If no one in your house has the strength to clamp these bars solidly onto the tub, then the user should have someone with the ability to tighten the bars sufficiently should be brought in to do the installation. One advantage of the clamp-on grab bar is it's portability. When moving or traveling the bar can be taken with you. A variation of the grab bar is the floor-to-ceiling pole. This is an option for those who require a secure handhold in a place where there are no walls to attach a conventional grab bar. The floor to ceiling pole can be installed in a bedroom, bathroom, living room or just about anywhere there is a need and a ceiling. The floor-to-ceiling bar clamps between the floor and the ceiling with a screw type mechanism and is adjustable for different height ceilings. Some manufacturers offer options to their floor to ceiling bars such as horizontal bars, trapeze bars, trays and other enhancements. As with the clamp-on bars, floor-to-ceiling poles are not fastened to the building but clamped so installation must be correctly and securely done. These bars are also transportable and can be taken with you if you move without having damaged the floor or ceiling where it was installed. These bars can't be used on sloped or dropped ceilings. Another type of bar which can be used in the bathroom is the flip-up grab bar. Flip-up grab bars are manufactured by several companies and vary a little in design but are very similar. I've seen them in chrome, stainless steel and painted steel. The pictured type of bar will flip up against the wall	when not needed and flipped back down when in use. These bars are secured to the wall with 6 to 8 screws and must be screwed into wood or concrete within the wall. Because wall studding usually doesn't accommodate the installation of these bars some modification to the wall is normally required. This modification of the wall can be as simple as mounting a board which spans a couple of studs to mount the flip up grab bar to or as extensive as removing the drywall or plaster, reinforcing the wall and refinishing the wall with new plaster or drywall before installation.